I hesitated and almost spelled it K@$ha, just for kicks. Kasha, also known as buckwheat groats, is the backbone of Russian and Eastern European cuisines, so much so that it is one of the oldest and most traditional foods consumed in Russia. It is often used in savoury side dishes, but can also be used as a breakfast porridge if cooked with a little soy milk and topped with fruits. Despite the word “wheat”, buckwheat/kasha does not contain gluten, therefore is suitable for those who avoid it. However, because I’ve combined it with regular pasta in this recipe, this recipe is gluten-containing. Add kasha, flaxseeds and 3 tbsp. water to a pan and heat on moderate heat, stirring all the while, until grains smell nice and toasty (roughly 2 minutes). Add the 2 cups water, salt and pepper, and cook until kasha is soft and water has been absorbed (about 10 minutes). In a separate pot, cook pasta as per the bag’s instructions until desired tenderness is obtained. As the kasha and pasta are cooking, toast the walnuts in 1 tbsp. olive oil along with the freshy thyme, garlic and onion. Cook for about 10-15 minutes, until onions are well-cooked and browned. 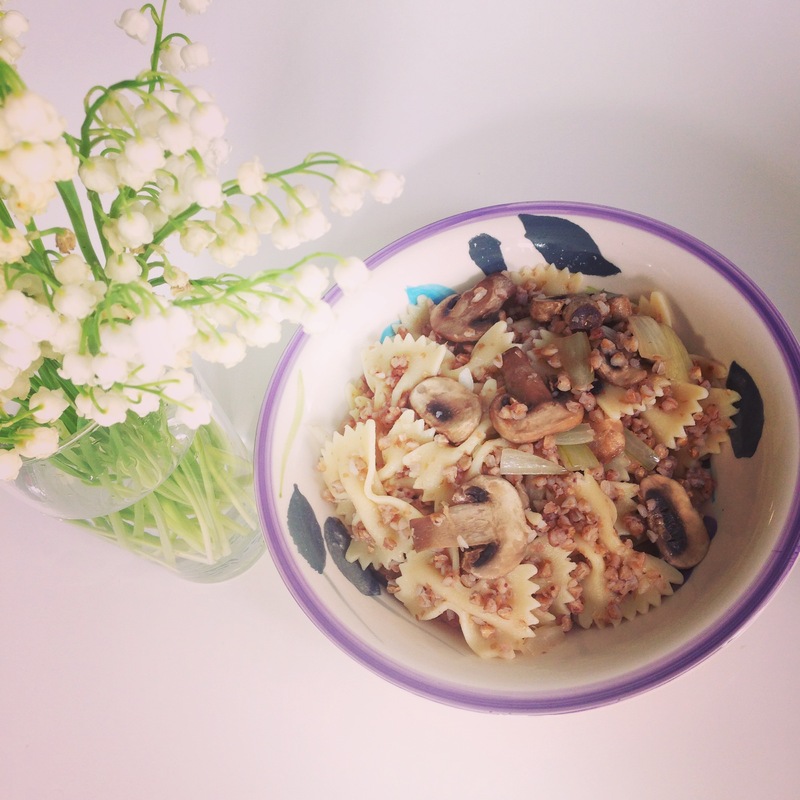 Mix nuts, onion and thyme with the cooked kasha and pasta. Mix in some fresh parsley.